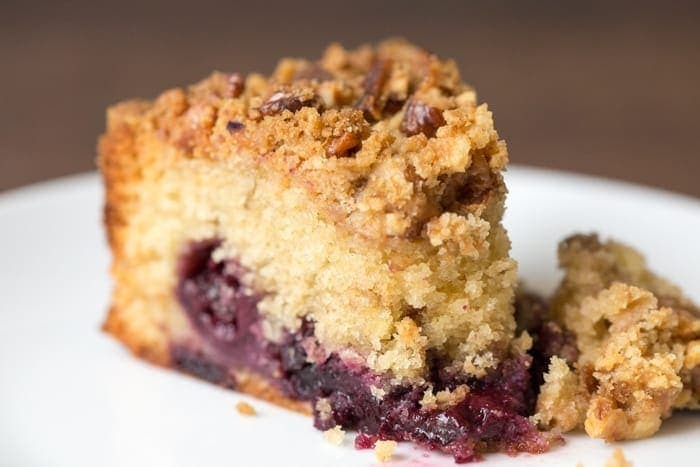 I LOVE a crumble cake. 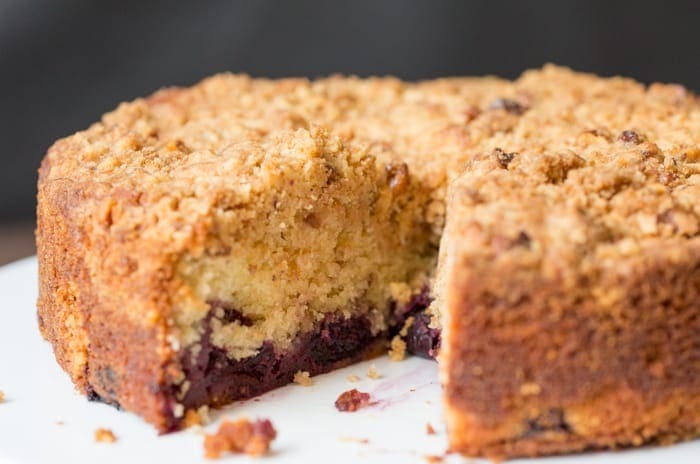 The crumble topping on this Cherry Crumble cake is AMAZING, you have to try it! The light sponge, no-spoon-required-handleability(real word?) 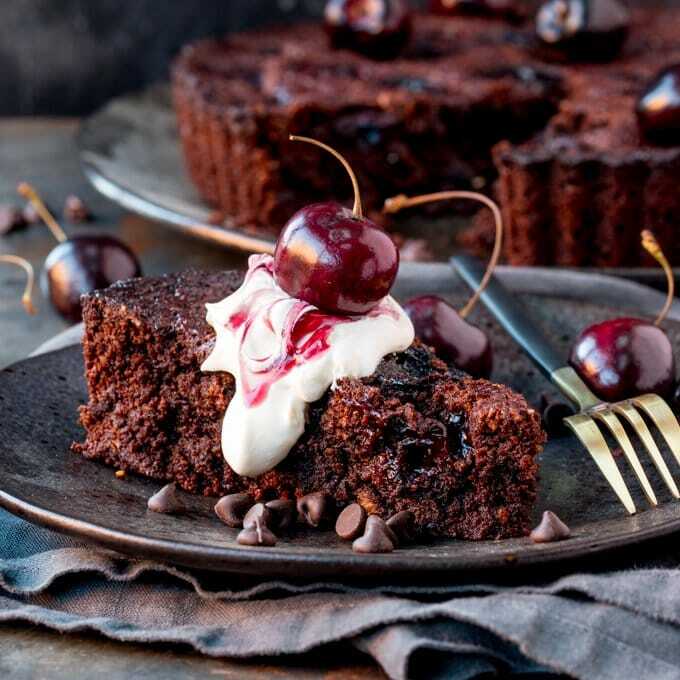 of a cherry cake combined with the buttery, crunchiness of a crumble pudding. Yes, this is 2 puddings in one, and all the better for it. I love a good crumble, but I have to admit that July is not really crumble weather. 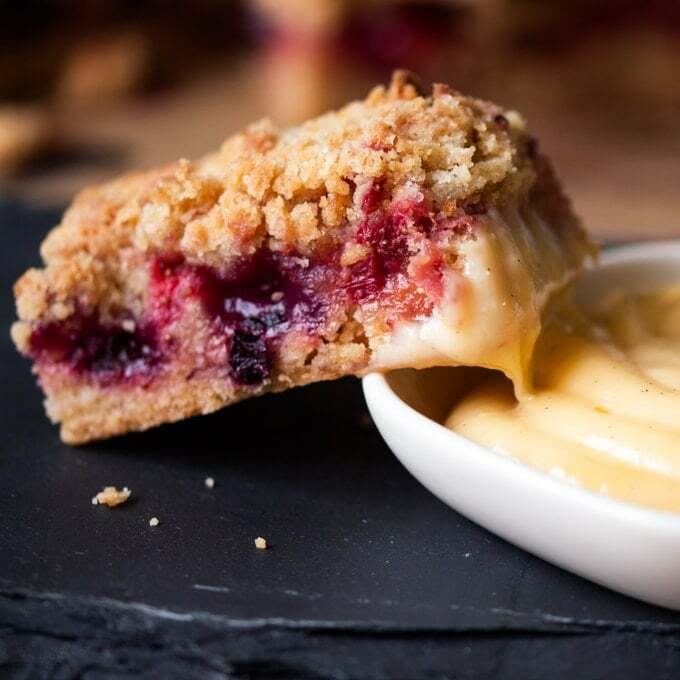 So I think I’ll just add crumble toppings to everything instead – like this delicious pud, or my apple crumble cookies. I’m also considering crumble brownies, crumble cupcakes and maybe ice cream crumble? Oh yes, that’d definitely work. Watch out for that one. I used walnuts in the crumble topping to give it some extra crunch. Pistachios, pecans, hazelnuts or almond would also be great. I also used frozen cherries, but you can replace these with fresh cherries. If you do, then you’ll need to reduce the cooking time by 10-20 minutes. The addition of soured cream in this recipe makes for a richer, more tender cake. You can replace with buttermilk or greek/natural yoghurt if you want to. 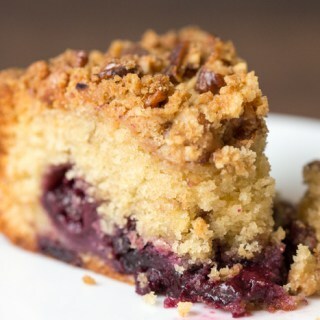 Cherry Crumble Cake - light sponge, buttery crumble topping and tangy cherry centre. Line the base of a 20cm loose bottomed cake tin with baking parchment and put to one side. Make your crumble topping first. Place your butter and flour in a bowl. Rub the flour into the butter with your fingertips until you have rough breadcrumbs. Add the sugar and walnut pieces and stir together. Put to one side. Next make the cake. Using a mixer, beat the butter and sugar together until pale and creamy. Stir in the eggs, vanilla extract and soured cream. Then gently fold in the flour, baking powder and salt. Finally stir in the frozen cherries. Pour the cake batter into the cake tin. Spread it around so that it's reasonably level, then sprinkle the crumble topping on then place in your preheated oven for 50-65 minutes - until an inserted skewer comes out clean. TIP: It's worth covering the cake with some tinfoil after about 40 minutes to prevent the top from burning. Tip This cake will stay fresh for 4-5 days, wrapped and stored in an air tight container. Perfect for dessert on Fathers Day, this will make my dad very happy. 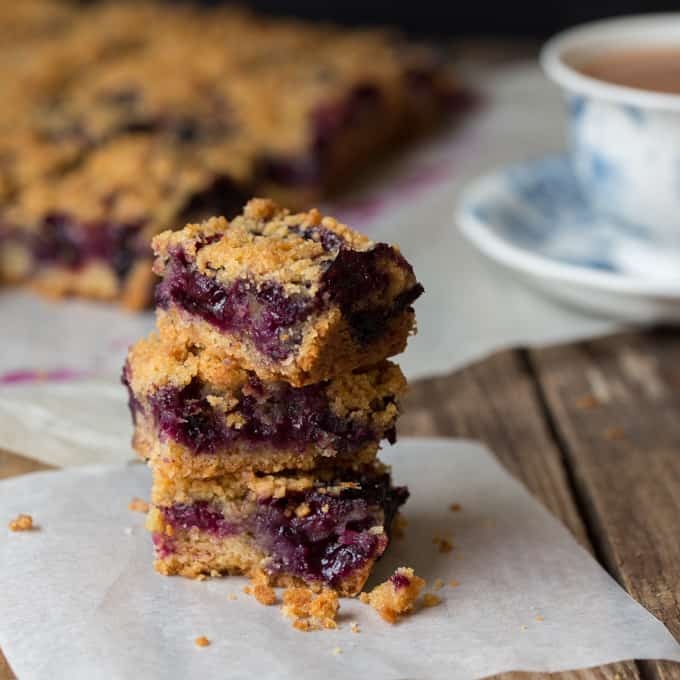 Great post, who doesn’t like a good crumble. 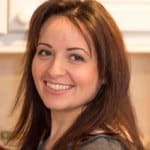 I love to bake, but have been banned from baking due to all of those extra pounds my baking seems to create on unsuspecting wives. 🙂 I just may make this one, I am sure my wife and I will love it. 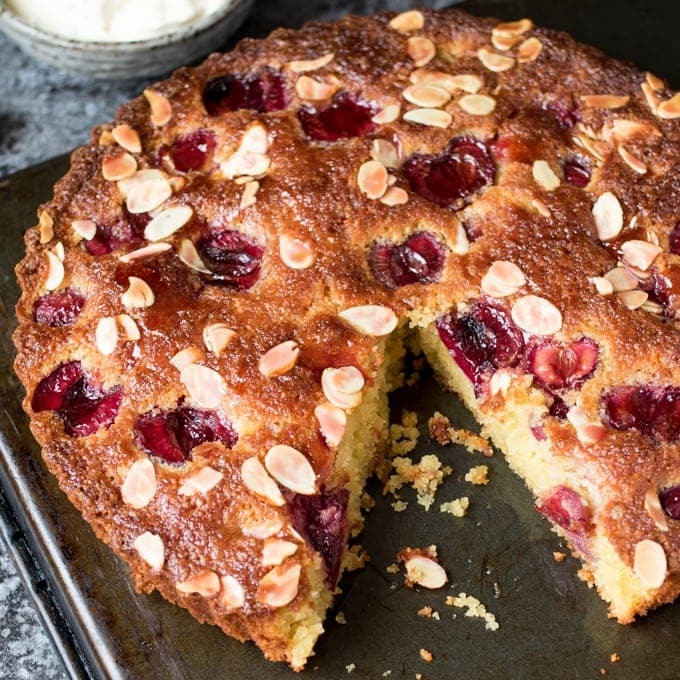 Very nice, I used fresh cherries and they still sank, think the use of soured cream (or Greek yoghurt in my case) made the cake lovely and light but not dense enough to hold the cherries. Still a lovely cake. 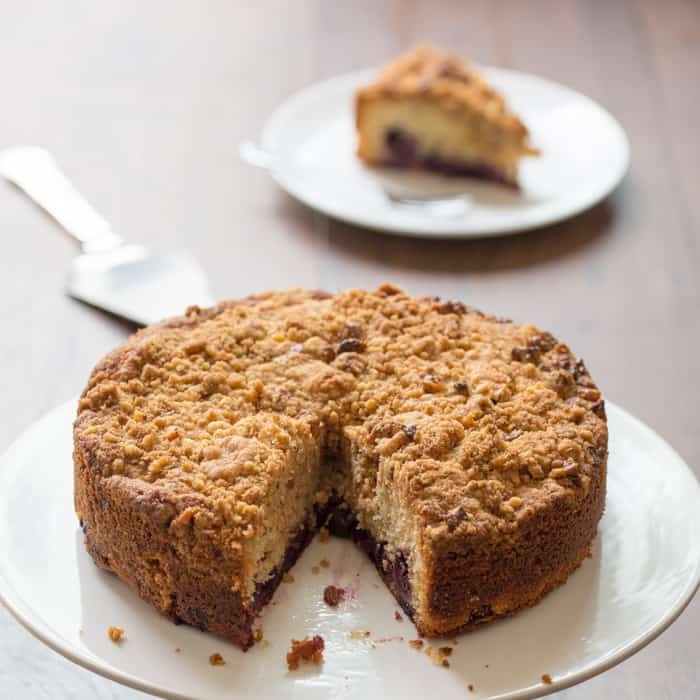 Gotta love crumble cakes 🙂 Have you tried a rhubarb crumble cake? sooo good!! I’ll be making that when I’ve worked off the calories from this one! !